The shop is filled with everything that adds a little more excitement, charm and beauty to women’s lives: jewellery, handbags, shoes and accessories selected, with dedication and good taste, from around the world. 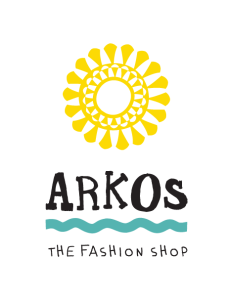 This is the “soul” and the raison d’être of ARKOS The Fashion Shop. To offer its guests the most relaxing and elegant shopping. To make their summer … unforgettable! Greek summers mean different things to different people – everyone has their own unique Greek summer. For us it is a heady mix of sensations that intoxicate the mind and soul, it is the unsurpassable beauty of the ancient Greek monuments, the way the sun and sea “play” together, the scents, the people who make their home here, in this country which inspires the eternal and the beautiful. Greek designers and fashion designers have put their artistic and ….subversive talents to work creating the ultimate summer collection! 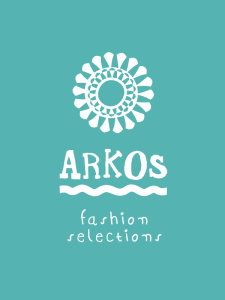 They created unique beach wraps, tunics, t-shirts, shorts, beach towels, flip flops and sandals, putting their own signature on ARKOS’ idea, to translate the sensations of Greek summer into… Fashion! This… cascade of senses is embodied in Arkos Designers’ Fashion range of clothing and accessories. Ancient Greek motifs have been used as the inspiration for the Arkos Designers’ Fashion series. These motifs have been creatively reimagined, have been given new resonance for today and have become more “feminine”.